My neighbor loves to try new plants, no matter how weird or difficult to grow in our area. This is a cucuzzi gourd from his garden. 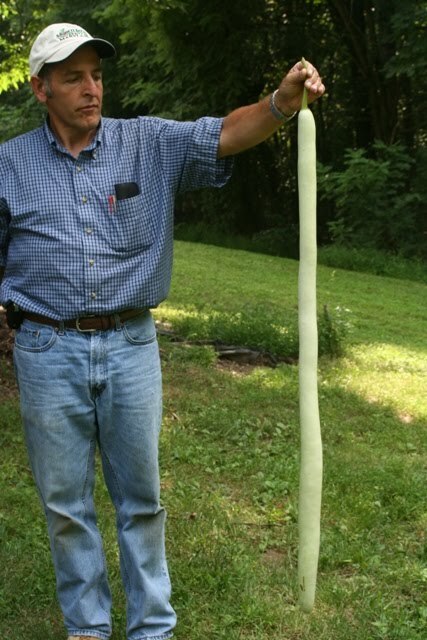 He harvested one fruit that was 4.5 ft. long! One gourd can feed our entire block. I read that some Italian growers train the vines to grow along tree branches so that the fruit will hang down for convenient harvest. They can be prepared and eaten as a summer squash when young. I sliced this one and fried it with garlic. Delicious. This has got to be a close relative of the zucchetta squash (also a member of the gourd family) we're growing in the demo garden, but not quite the same thing since that tends to swell out in a bulb at the end. I know we have pictures somewhere and I've been meaning to post them – will do that soon! What's coming up for fall crops? I am putting in lettuce and kale, of course. Is it too late to plant peas? Anything else I should try to get in now? I think 'Tromboncino' is another name for the same squash you are describing. Some have it classified as Cucurbita moschata. The cucuzzi is in the Lagenaria genus. I'll be planting arugula, spinach, mustard and radish here in Central MD. I will also plant beets without much hope of getting decent size roots. It is too late to plant peas which are generally tough to pull off here as a fall crop. I'll also plant garlic in Oct-Nov and cover crops in the next week or two- winter oats, forage radfish, and crimson clover. How are sweet potatoe vines eaten? Raw or cooked? I harvested 70 pounds of paste tomatoes this season and got about 12 quarts of tomatoe sauce plus some whole frozen and canned tomatoes. Has anyone made a greenhouse with removeable panes to convert into an open garden space during regular growing season? I would like to hear of any successful attempts to do this. Harvest young leaves and stems throughout the growing season and eat them fresh, boiled, or sauteed. I like to chop and add then to pasta dishes, frittatas, and stir-fry. I have read that the leaves have a higher protein content than the roots (on a dry weight basis).